Original blind-stamped calf over boards, rebacked, with brass studs and bronze clasps, remains of punch dotting. Purchased in Nov. 1956 from Arthur Rau, Paris, for William S. Glazier (1907-1962), New York; deposited in the Pierpont Morgan Library by the Trustees of the William S. Glazier Collection in 1963. 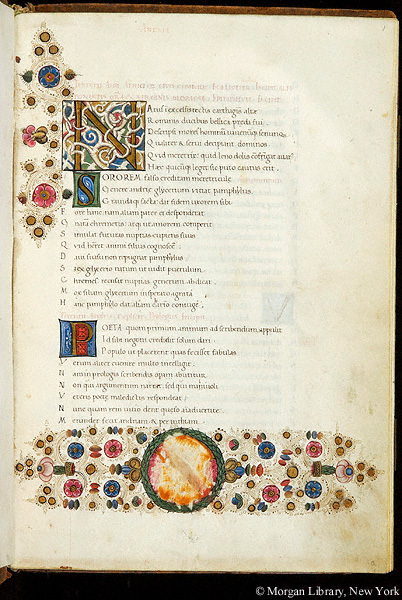 Ms. written and illuminated in Lombardy, Italy, ca. 1480. Each of the comedies has an argument and prologue. Decoration: 6 large illuminated white-vine initials, 1 armorial roundel, numerous smaller illuminated initials.